First up is the Cherryliscious Lotion. Infused with nourishing oils of jojoba, shea butter & coconut this body lotion will keep your skin hydrated and extremely soft. I keep this lotion at my desk at work and use it often. My skin on my hands is very dry naturally so I am applying lotion all day. I love that I know what I am putting on my hands when I use this lotion. Its creamy and is absorbed easily into my skin and does not leave an oily feeling like some lotions do. A small amount of this lotion goes a long way and I feel like I have to apply this less often than other lotions I have used in the past. Made with organic & food-grade ingredients, Lip Balm will keep your lips smooth for hours! We add only organic flavor compounds making our lip balms the tastiest around! My lips dry so easy and I have a bad habit of picking them when my lips are dry so needless to say I try to keep them moisturized. I am torn on which is my favorite because I love the smell of pineapple and lemons so to me they are amazing. The minty vanilla cooler is very minty so if you don't like mint (like me) steer clear of this one. My friend who likes mint enjoyed that one quite a bit. Have you ever used a lip balm or chap stick and lick your lips absent mindedly and it taste horrible? This isn't one of those!!! They taste pretty good and make my lips feel protected from this Polar Vortex we have been having. When you wear this it doesn't feel heavy or waxy but you lips feel instantly moisturized. hydrates your lips while adding a touch of color. 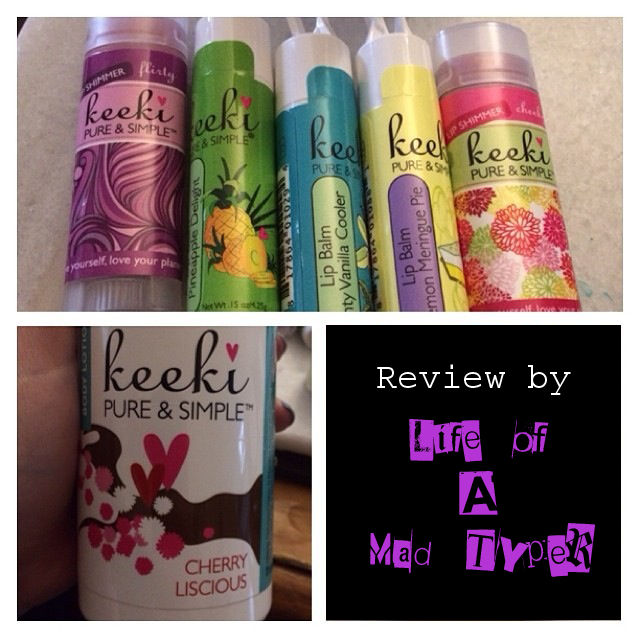 I love that with Keeki everything is all natural and you know what you are using is safe. In a world where it seems everyday something we know so well is being accused of causing cancer or some other health issue (Like sweet and low or diet coke) this is becoming more and more important to know what you are putting into your body. Here is some history on the company. Keeki Pure & Simple is the creation of Natalie Bauss, a mom of two, who lives on an organic farm in West Michigan. Bauss, a California native with 20 years of experience as an esthetician and a background in sales and marketing, had been checking out reference works from the library and conducting exhaustive research in her quest to make wholesome products for her own friends and family. "I started out creating recipes in my kitchen from things we'd grown on the farm, just experimenting," she says. As a mother of a now 14 year old daughter she became amazed at what she had discovered about the cosmetic industry. She began to understand that her maternal instincts could not let her daughter or her daughter’s friends go anywhere near certain products, even if they were being sold in some of the biggest retail stores in America. As research and experience turned into a lifelong obsession, which is now culminating into one of the most ecofriendly, and sound product lines in the market today. Natalie hopes to take her message to women and teens everywhere. What started as a kitchen experiment for her own kids and their friends, has grown into an international brand in just two short years! With the sky as the limit Keeki Pure and Simple is here to start a trend which is aimed at the sound mind, body, and soul of every woman on this planet. Now, Bauss and the Keeki Team provide safe products for girls and women all over the world. all products before they hit the shelves. I was most interested to read about the shimmer stick. I am SO glad you said it is peperminty because that could have been an unpleasant suprise. I find that it tingles a bit so I typically like that in a lip product. I am suprised that a shimmer stick has a matte finish. This was a great review and I still might try the shimmer stick.